Information protection and security is vital to the sustainability and success of small business and the national economy. As advocates and resource partners for the business community and service providers for the federal government, it is our role to educate and assist with federal contracting compliance guidelines and information security awareness. More than two thirds of all small businesses report that are dependent on the internet for day-to-day activities. Yet, according to the National Cybersecurity Alliance, most small businesses don’t do enough to protect themselves online. Twenty percent of small businesses don’t have or use anti-virus software. Sixty percent don’t use any encryption on their wireless networks, and fewer than 30% have a security plan in place. 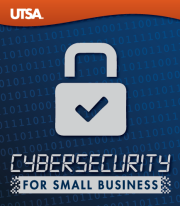 This program is designed to provide awareness through training, one-on-one assistance with cybersecurity action plan development and implementation working with other UTSA specialty centers on cybersecurity. What information does your business collect? Cyber Security for Small Business will help you learn more about the security principles you should keep in mind when online, as well as the ways you can protect your information and networks in case of a cyberattack. For in-person assistance, visit your local SBA office or mentor. The Department of Homeland Security (DHS) and its partners have established a Critical Infrastructure Cyber Community (C3) Voluntary Program to help educate business owners about cybersecurity. The C3 Voluntary Program Toolkit for Small and Midsize Businesses contains resources to help your business recognize and address cybersecurity risks, including Fact Sheets for Startups and Leadership and a Hands-On Resources Guide. Learn more at https://www.us-cert.gov/ccubedvp/getting-started-smb. The Cyber Resilience Review Assessment Tool evaluates ten domains including risk management, incident management, service continuity, and may be conducted as a self-assessment or as an in-person, facilitated assessment. Developed by DHS, this no-cost, voluntary tool helps businesses assess their information technology resilience. For more information, visit https://www.us-cert.gov/ccubedvp/self-service-crr. Cybersecurity Advisors or CSAs are regionally-located DHS personnel who offer immediate and sustained cybersecurity assistance to prepare and protect organizations, including small and mid-sized businesses. Services include on-site meetings to answer questions, exchange information and address concerns about cybersecurity; educational and awareness briefings; and assessments, including a full-day, expert-led a Cyber Resilience Review (CRR) evaluation that assess cybersecurity management practices. 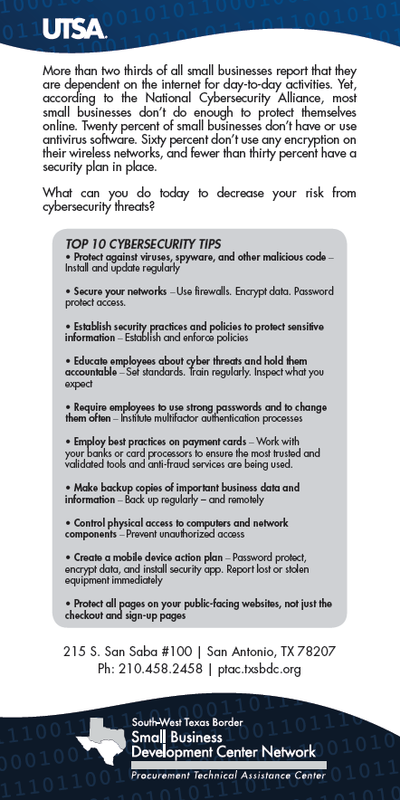 For more information about CSAs, please email cyberadvisor@hq.dhs.gov (link sends e-mail). This collection of resources from various levels of government can help small and midsize businesses recognize and address their cybersecurity risks. Access resources in your area.